The International Standard Classification of Occupations (ISCO) defines welders and flame cutters as welding and cutting metal parts using gas flame, electric arc and other sources of heat to melt and cut, or to melt and fuse metal. Welders are employed in average numbers of 3 to 5 in private owned small-scale workshops. As they come under the non-organized sector, safety precautions are not strictly implemented. Some of the commonly seen injuries are eye injuries like arc eye or flash burns to cornea, photo keratosis, astigmatism, pingecula, cataract and retinal damage due to exposure to excessive light and ultra violet rays and foreign body injuries to cornea. Inhalation of metal fume causes metal fume fever and pneumonia due to exposure to noxious fumes of zinc, copper, cobalt, nickel, chromium, platinum and their oxides. Other injuries that include accidental cut injuries, amputations; occupational heat stress, thermal burns, electrocution are also common among welders. In spite of the major public health problem existing among welders, very few studies have been conducted to assess the pattern of all types of injuries and its associated risk factors at global level. ,, Studies of such nature will give information in developing appropriate prevention methods. There exists no published literature to give us an idea about the magnitude of the problem in this vulnerable group in India. With this background, the study aimed to assess the prevalence of work-related injuries and its associated factors among welders in coastal South India. This study was approved by the ethical committee of the medical institution in Puducherry, India. Subjects were ensured confidentiality and they were explained the purpose and ethical issues involved in the study. Written informed consent was obtained from each subject participating in the study. This cross sectional study was conducted among welders in Puducherry, a coastal city in South India. A total of 778 registered metal industries in Puducherry district are spread over 7 commune regions and for the study purpose Puducherry commune region which has got 174 registered metal industries was selected. This region was selected based on feasibility constraints and it will not affect the study outcome because of the comparable socio-demographic and other parameters in these areas. From this area metal industries were selected randomly by using the register number and all the workers in that metal industry were included for our study until our study sample was met. Sample size was estimated by using the formula 4pq/d΂, where prevalence 'p' was taken as 19% based on previous study  and required relative precision of estimate at 30% level. By using the formula, minimum sample size became 190. Considering a non-response error of 10%, final total sample size became 209. All the workers in the randomly selected metal industry with more than 1 year experience were included in the study. If the selected subject does not give consent or could not be able to meet even after two visits, then they are considered as non-respondents. The data was collected by administering a pre designed questionnaire by the investigators based on the lines of guidelines of International Labor Organization. The questionnaire was translated to Tamil language and back translated to English language by independent experts to retain the reliability of the instrument. It was pretested and necessary modifications were made according to field conditions. The subjects were interviewed in person by the investigators at their work place according to pre scheduled time table. Baseline data was collected regarding socio-demographic variables that include age, education, marital status and monthly income. 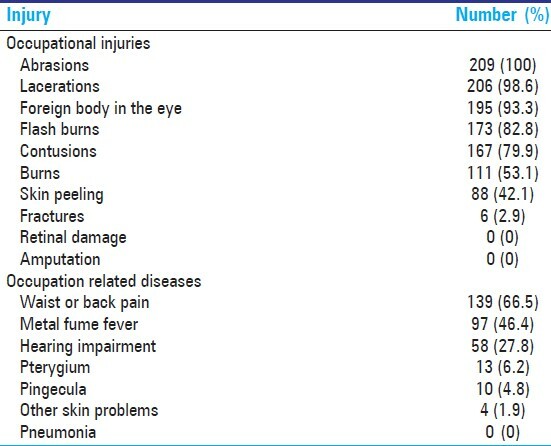 Data regarding all types of injuries related to occupation during the past 1 year at work place that include mechanical injuries, arc eye injuries, foreign body in the eye, retinal damage, burns, electrical injury and occupational diseases or hazards like back ache or waist pain, hearing impairment, pingecula, pterygium, metal fume fever and pneumonia were collected based on history and or previous diagnosis by registered medical practitioner. The collected data was entered in Statistical Package for Social Sciences (SPSS) version 16 for windows. Data was analyzed and expressed in terms of proportion and percentages. Univariate and multivariate analyses were done to find out the possible association between number of injuries and associated factors. A P < 0.05 is considered as significant. All 209 welders participated in the study and they were all males. 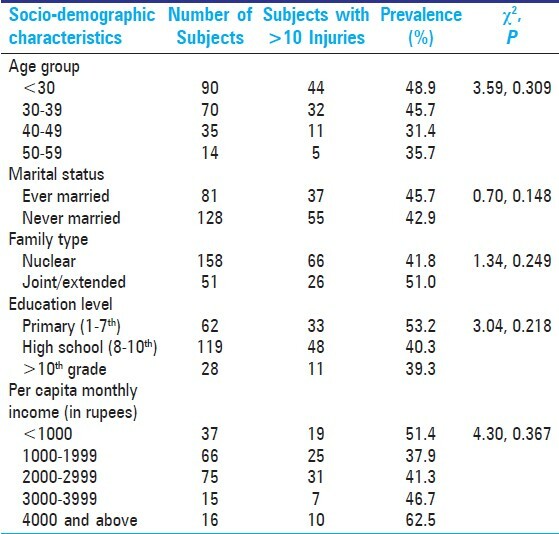 Majority of them were aged 20 to 40 years (160, 76.6%), educated below 10 th standard (181, 86.6%) and their per capita income was below 3000 rupees (178, 85.2%).Mean number of injury was found to be 10.74 (SD = 5.74) in the preceding year. All of them had abrasions and more than - of them had lacerations, foreign body in the eye, flash burns and contusions. Majority of them had more than 2 injuries (97.1%, 203) and 44% (92) of them had more than 10 injuries. No one reported pneumonia, retinal damage and amputation. About 66.5% (139) had occupational diseases or hazards like waist or back pain and 27.8% (58) had hearing impairment [Table 1]. The majority of them had more than 5 years experience (175, 83.7%) and were working less than 8 hours each day (156, 74.6%), but only 1/5 of them had institutional training (40,19.1%). About one quarter of them were using tobacco (57, 27.3%) and about half of them were using alcohol (114, 54.5%). Prevalence was comparatively higher among less than 30 years age group (48.9%) and in the group with education between 1 st and 7 th grade (53.2%) [Table 2]. 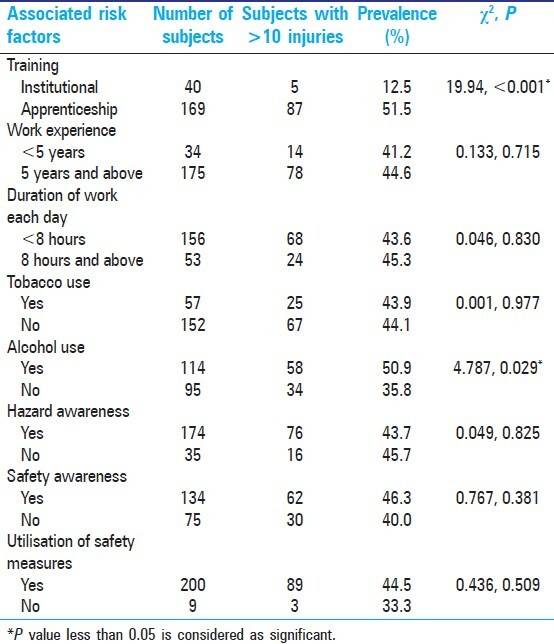 Prevalence was found to be comparatively higher among those who did not have institutional training and use alcohol; and both the above factors were found to be significantly associated with more than 10 injuries in univariate analysis [Table 3]. 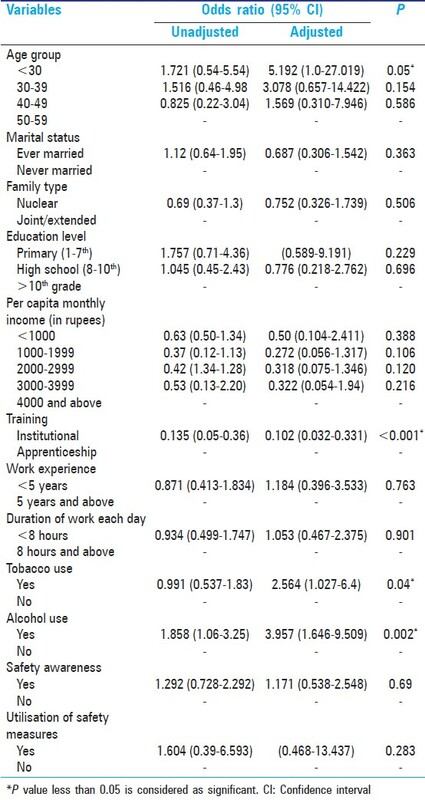 Multiple logistic regression analysis showed that age less than 30 years (OR = 5.19), tobacco use (OR = 2.56), alcohol use (OR = 3.96) and institutional training (OR = 0.10) were independently associated with more than 10 injuries [Table 4]. Well-documented studies to determine the epidemiology of injuries among welders at work place are very few at global level. But there are some other studies done among workers of other industries in India. , The fact that majority of them had more than 2 injuries and proportion of those with more than 10 injuries is 44% in the previous year is a matter of concern. A recent study in a metal smelting industry in India reported that incidence rate of injuries varied from 40.7 to 85.8 per thousand exposed workers. Adopting health promotional measures at workplace is an important measure to prevent injuries. Our study gives valuable information regarding the burden and associated risk factors of injury among welders in this part of the country, which can be used by the concerned authorities to develop appropriate interventional measures. A recent study from Nigeria showed that 85.3% of the welders had at least one injury in the preceding year. Another study found that 105 injuries were reported by 61 welders out of 208 welders in the past 6 months. A study done in Pakistan showed that 18.7% welders reported an injury in the past 3 months, while 30.3% welders reported sustaining an injury in the past twelve months. The difference in injuries reported in various countries may be due to the difference in methodology adopted, socio-cultural and regulatory factors adopted by concerned states. The most common injuries sustained in our study were abrasions, lacerations, contusions and eye injuries which are comparatively more than other studies. Also, around half of them had afflicted with each condition of waist/back pain, burns and metal fume fever. Back pain was found to be commonly associated with welders. This is in spite of the fact that majority of them were working for less than 8 hours a day and were aware regarding this hazard. Our study highlighted the fact that predictors of injury includes age less than 30 years, alcohol use, tobacco use and lack of institutional training. A recent study showed that injury is more common among younger age group and those without training. In view of the above finding, it is suggested that adopting the sustainable behavioral change practices for the prevention of injuries through training and adoption of personal protective measures is an important step to be considered. Nearly half of the subjects belonged to age group of less than 30 years (43%, 90). They are five times higher at risk of developing more than 10 injuries as compared to the above 50 years age group. This may be probably due to less working efficiency in younger age group. Also, majority of them did not had institutional training. Other studies also found similar findings. , Injuries were noted only in males in this study because only males were employed and this is likely to be due to the fact that welding employs males commonly in this region. All the study participants were literate in contrast to Nigerian study which reported 7.6% illiterates. Although literacy will help in understanding of basic safety measures, here we did not find any association. This may be because of lack of awareness to safety measures (36%, 75) and utilization of all relevant safety measures during working hours. Besides, majority (80.9%) of welders received their training through apprenticeship training. The cross sectional study nature and recall bias are the limitations of the study. Because of feasibility constraints, we could not include the welders working outside the Puducherry city area. We could not analyze the quantification of certain factors like alcohol and tobacco use. Longitudinal studies will be required to look further into the role of associated factors of injury among welders. Injury among welders is an important public health problem in this area, in the context of high prevalence rate and larger involvement of at risk worker population in welding metal industries. Strategies for reducing the tobacco and alcohol use and strengthening of institutional training especially for younger age groups may help in decreasing the burden of injuries in this vulnerable group. The project was a part of Indian Council of Medical Research under short term studentship (ICMR STS for the year 2011) project. We thank the subjects participated in the study. World Health Organisation. Global Health Risks, Mortality and Burden of diseases attributable to major health risks. Geneva: WHO; 2009. Available from: http://www.who.int/healthinfo/global_burden_disease/GlobalHealthRisks_report_full.pdf [Last accessed on 2011 Sept 22]. Benavides FG, Delclos J, Benach J, Serra C. Occupational injury, A public health priority. Rev Esp Salud Publica 2006;80:553-65. Agnihotram RV. An overview of occupational health research in India. Indian J Occup Environ Med 2005;9:10-4.
International Labor Organisation. Updating the International Standard Classifications of occupations. ILO: Department of Statistics; 2008. Available from: http://www.ilo.org/public/english/bureau/stat/isco/docs/d5b.pdf. [Last accessed on 2011 Sept 20]. Shaikh MA, Shaikh IA. Occupational injuries in welders--results from a six month follow-up study. J Ayub Med Coll Abbottabad 2005;17:9-11. Sabitu K, Iliyasu Z, Dauda MM. Awareness of occupational hazards and utilization of safety measures among welders in Kaduna metropolis, Northern Nigeria. Ann Afr Med 2009;1:46-51. Isah EC, Okojie OH. Occupational health problems of welders in Benin City, Nigeria. J Med Biomed Res 2006;5:64-9. Shaikh MA. Hazard perception and occupational injuries in the welders and lathe machine operators of Rawalpindi and Islamabad. J Pak Med Assoc 2001;51:71-4. Brancoli M. Accident statistics. In: International Labor Office. Encyclopaedia of Occupational Health and Safty. 13 th ed. Geneva: International Labour Organization (ILO); 1983. p. 32-5. Chobanian AV, Bakris GL, Black HR, Cushman WC, Green LA, Izzo JL Jr, et al. The Seventh Report of the Joint National Committee on Prevention, Detection, Evaluation, and Treatment of High Blood Pressure: The JNC 7 Report. JAMA 2003;289:2573-5. Kumar SG, Rathnakar U, Harsha Kumar H. Epidemiology of accidents in tile factories of Mangalore city in Karnataka. Indian J Community Med 2010;35:78-81. Calvin S, Joseph B. Occupational related accidents in selected garment industries in Bangalore city. Indian J Community Med 2006;31:151-2. Saha A, Kumar S, Vasudevan DM. Occupational injury surveillance: A study in a metal smelting industry. Indian J Occup Environ Med 2007;11;103-07. Kumar SG. Issues related to health promotional measures at workplace. Int J Occup Saf Health 2011;1:5-6. Vieira ER, Kumar S, Narayan Y. Smoking, no-exercise, overweight and low back disorder in welders and nurses. Int J Ind Ergon 2008; 38:143-9. Reesal MR, Dufresne RM, Suggett D, Alleyne BC. Welder eye injuries. J Occup Med 1989;31:1003-6. Lombardi DA, Pannala R, Sorock GS, Wellman H, Courtney TK, Verma S, et al. Welding related occupational eye injuries: A narrative analysis. Inj Prev 2005;11:174-9. Fiebai B, Awoyesuku EA. Ocular injuries among industrial welders in Port Harcourt, Nigeria. Clin Ophthalmol 2011;5:1261-3.